Newsletter Reader Question: It is almost Chinese New Year, the Year of the Rooster, and I would like to know how important it is for me to know about these types of cultural celebrations? I live in Australia and do a lot of business around the world. As a general rule, it is always valuable to be aware of and know a little about the different types of events and festivals other cultures celebrate. This cultural knowledge will certainly be a beneficial asset when dealing with other cultures in a business context. Most people will be cognisant of at least a few of the major cultural celebrations that happen around the world, including Chinese New Year, Eid al Fitr, Hanukkah, and Diwali. Each of these are events are certainly celebrated by Australia's major ethnic and religious communities. There are many more events that you may or may not be familiar with, and this will often depend on your proximity to these other cultures. Homogenous societies are less likely to integrate a diverse range of celebrations by their very nature. I recently wrote an e-Blast for a client that examined the different attributes that make for a culturally intelligent leader. Curiosity was one of the core attributes; leaders with high cultural intelligence are naturally curious about the world around them. They are deeply motivated to want to find out more by asking lots of questions and also actively listening to what others have to say. I believe curiosity should drive each of us in our own inter-cultural explorations. Understanding the values of other cultures and what their celebrations represent is certainly an important step we can all take towards representing and appreciating Diversity and Inclusion in our communities. This month I have chosen a book that I picked up in Singapore during my recent travels. I presented with the author, Brenda Bence, in Delhi this past July and had been looking forward to its release. 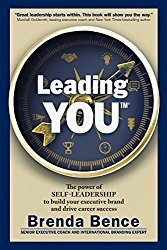 Leading YOU is the follow-up companion book to her award-winning Would YOU Want to Work for YOU? As a Senior Executive Coach, Brenda Bence understands the challenges of senior leadership roles and has guided hundreds of leaders around the globe to transformational growth and success. In this book, Bence has examined her many years of coaching experience to reveal the 15 most damaging self-leadership behaviours she encounters far too regularly. She offers valuable tools and techniques, supplemented with real-life case studies, to help readers transform these behaviours and realise their true career potential as a leader.